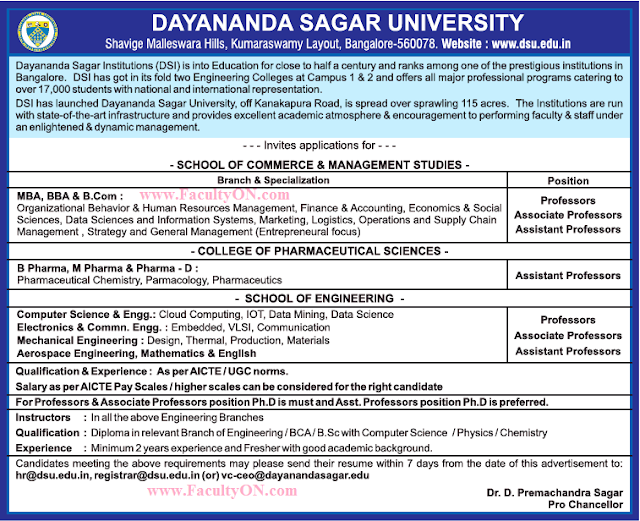 Dayananda Sagar University, Bangalore has advertised in THE TIMES OF INDIA newspaper for recruitment of Professor / Associate Professor / Assistant Professor Plus Non-Faculty jobs vacancies. Interested and eligible job aspirants are requested to apply within 07 days from 04th April 2018. Check out further more details below. About University: One of the India’s leading educational institutions, a front-runner in the field of education today, Dayananda Sagar Institutions (DSI) is run under the aegis of the Mahatma Gandhi Vidya Peetha Trust, in Bangalore- described as the Silicon Valley of India. Our institutions are characterized by the quality of education across a broad range of disciplines from pre-university courses to post-graduation and doctoral programs covering Engineering, Dental Sciences, Biological Sciences Arts, Commerce, Sciences, Pharmacy, Nursing, Allied Health, as well as Business Management and Information Technology.